This is our last day in New Zealand. The ship docked in Dunedin this morning. We were supposed to take a wildlife safari tour in 8 wheel drive vehicles, but decided we would rather skip the tour and go into town on our own. It was overcast with occasional drizzle today, so we think we made the better choice. There were hourly shuttle buses from the port into the center of town. After breakfast we visited the tour desk to get a map of town, and then caught the 10:30am shuttle. The shuttle dropped us of on the octagon in the center of town. After a walk around the shopping area, we headed down to the historic train station. This is a beautiful old station with lovely gardens in front. Last time we were here we took the train ride here. It was a lovely ride. The station is also a transportation museum and has lots of neat old trains, cars, bicycles, and other forms of transportation. 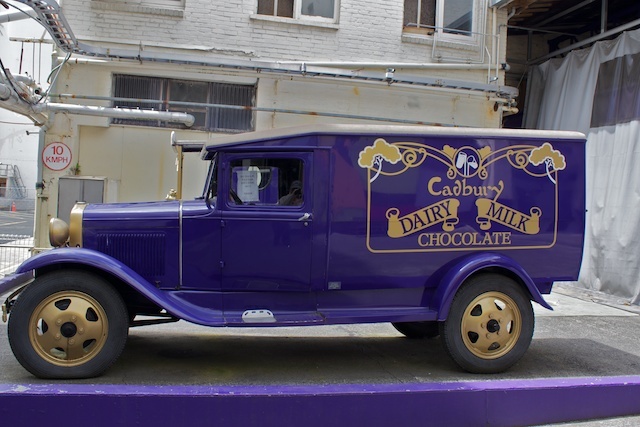 From there we headed for the Cadbury Factory tour. 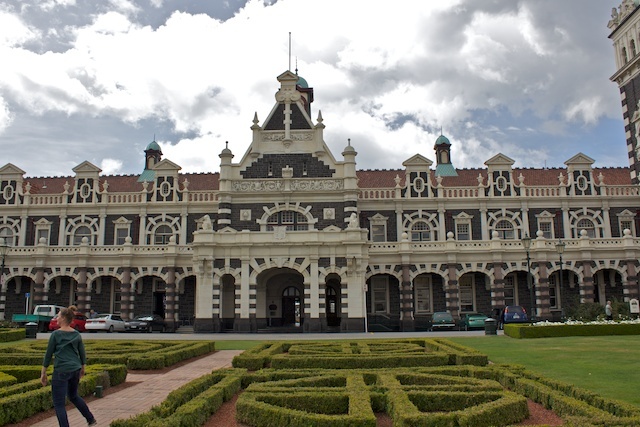 Although Cadbury was founded in England, they purchased a troubled chocolate factory in Dunedin years ago and now Cadbury chocolates are made here as well. The tour was fun. The guide was very good and she gave out chocolate candies as prizes for answering questions along the way. Of course, we bought a supply of chocolates before we left. Before heading back, we stopped for lunch at a local tavern on the octagon. Ray ordered a burger and I ordered the special of the day - filet of Sole. The way this was prepared was both unusual and a pleasant surprise. There was a a layer of hash brown potatoes with the fillet on top. This was topped with a poached egg. There was a mild cheese sauce over the whole thing. I would not have thought to put that combination of flavors together, but it was delicious. I also enjoyed the pub's own micro brew white beer with it. This was a very nice day, a great way to spend our last day on shore in New Zealand. I do love this country. The countryside is diverse and beautiful, and the people are some of the friendliest I have found anywhere. We will be sailing through the sounds tomorrow, then off to Australia.